Double Entendre Music Ensemble performs music that delights audiences with the rich sounds of double reed instruments. From Bach to Bresnick, our concerts are passionate, uplifting and lively. Our next performance will be at An Beal Bocht Cafe on July 27th at 4:00 P.M. in collaboration with ClassicalCafe! We are excited about our third season of Double Entendre On the Town in 2019. 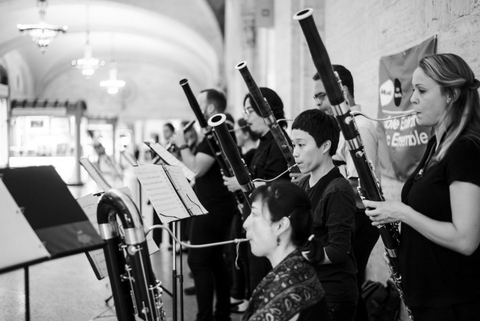 Check back soon for information about this year's concerts, which will feature the Phantasy Quartet, the Central Avenue Trio, and the Double Entendre Bassoon Collective, as well as appearances at The High Line and Grand Central. Double Entendre On the Town is a new project made possible by the New York State Council on the Arts with the support of Governor Andrew Cuomo and the New York State Legislature. Our programs are also supported, in part, by public funds from the New York City Department of Cultural Affairs in partnership with the City Council, by the Music Performance Trust Fund, and by private foundations. Check back for updates to our 2018 concert schedule!